Hailed as a 'great success' by Scottish Field the family Estate enjoyed toasting a deal which is has deep family connections woven through the heart of it. Richard Pooley, Director of The Conan Doyle Estate and Step Great Grandson of Arthur Conan Doyle shares his thoughts and family insights into this exciting new licence for the Estate HERE. Tales of the Tartan have swept the UK with features seen in The Sunday Telegraph, i Newspaper, The Scotsman and the Daily Mail to name a few. This is the first time that a literary character has had their own tartan approved by the Scottish Register of Tartans. Holmes was created by Sir Arthur Conan Doyle who was born in Edinburgh and gained his medical degree from Edinburgh University. 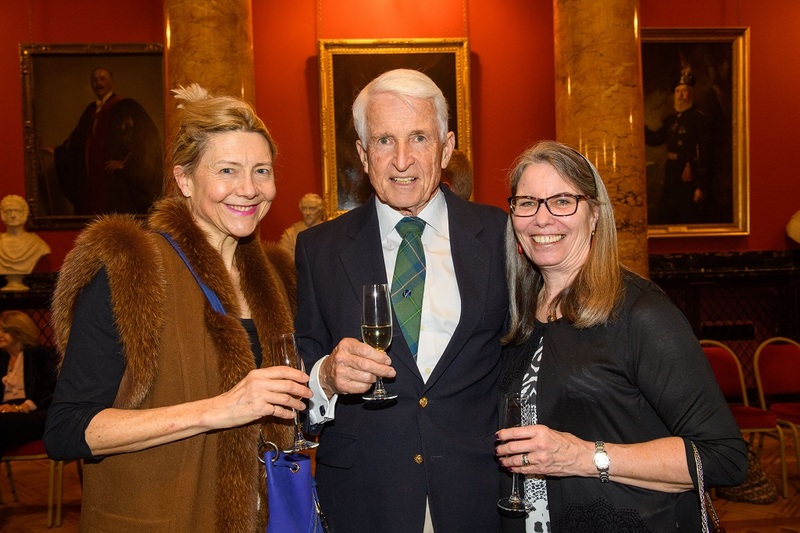 Appropriately, the official launch party took place on Thursday, 22 March, at the Royal College of Physicians on Queen Street in Edinburgh. And it is a Conan Doyle descendant who has highlighted these Scottish links through creation of a uniquely Scottish textile for his most famous character. It was designed by Tania Henzell, a great-great step granddaughter of the author, who worked with weavers the House of Edgar to finalise the design and have it registered. Rather being than a study in scarlet, the Sherlock Holmes tartan is predominately green and blue – reflecting Conan Doyle’s Irish and Scottish heritage – highlighted by a lighter blue line to represent the Reichenbach Falls and a yellow line to represent the deductive clarity of Sherlock. Tania said: ‘Tartan has great design appeal, and it was a fascinating experience coming up with a pattern that reflects who Conan Doyle was as well as tying in elements that are entirely Sherlock. ‘I was very fond of my step great grandmother Jean, who was Sir Arthur Conan Doyle’s youngest daughter, so creating the tartan has been quite an emotional and nostalgic process, but also very rewarding. Sherlock Holmes has a distinctive style, which owes much to early cinema portrayals. Actor Basil Rathbone is often considered the quintessential Holmes, playing the detective in a string of classic movies, starting with the Hound of the Baskervilles in 1939 and continuing throughout the 1940s. The deerstalker cap and Inverness cape became so iconic of Holmes that even television’s most recent interpretation of the character, played by Benedict Cumberbatch makes ironic reference to the headwear. The new tartan is not only being used for deerstalkers and cape but ties, cushions, cummerbunds, handbags, waistcoats and trews are all being produced in the new wool fabric. It is perfect for sleuthing on the moors, uncovering grisly deeds in stately homes or whiling away an evening in a Baker Street apartment. Sherlock tartan products are coming soon and will be available HERE. Certain items will be made to measure and new products will be added to the website on an ongoing basis. 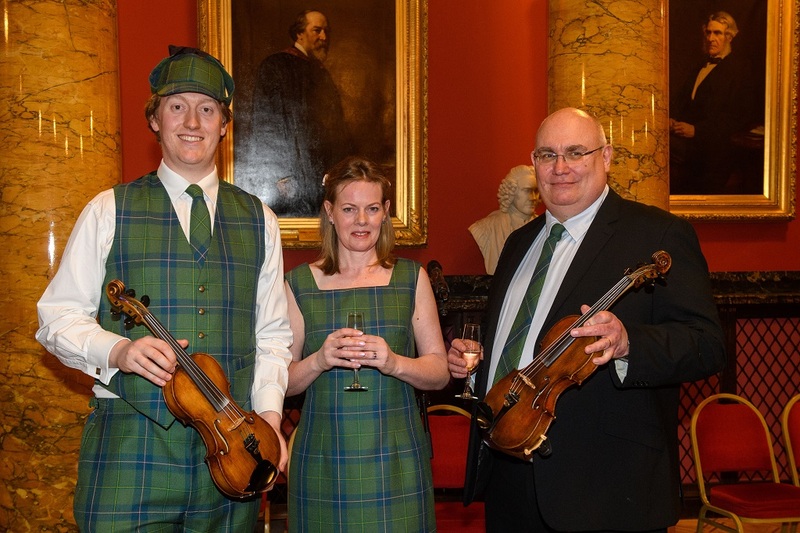 The Sherlock Holmes Tartan launch night at The Royal College of Physicians, Edinburgh, with Great, Great, Great Step Grandson Harry Chamberlain (left) and Great-Great step granddaughter Tania Henzell, and Arthur Conan Doyle’s great-nephew Richard Doyle. 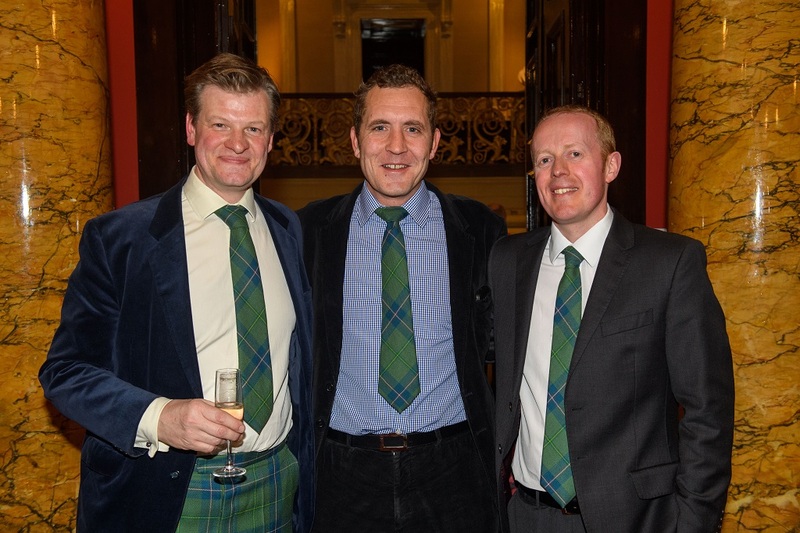 The Sherlock Holmes tartan was approved by (from left) Mark Henzell, and Arthur Conan Doyle’s step great great grandsons Jeffrey Pooley, and Simon Humphrey-Adam, who feature it on their ties.